Protect usage of sensitive production data for nonproductive purposes. DataSunrise can guarantee its safe access by out-source employees, testers, developers, etc. 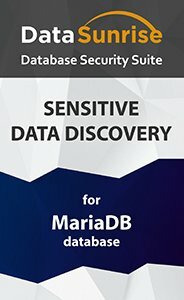 Its integrated Sensitive Data Discovery component allows you to locate MariaDB objects that contain confidential information and protect it with required protection measures: Masking, Security and Audit Rules. DataSunrise Data Discovery for MariaDB is dedicated to search for sensitive information stored within your database and prevent its leakage by setting special Security, Audit and Masking Rules to control operations with it. DataSunrise search process for objects that contain sensitive information is performed in accordance with preset filters. New search for objects that are to be secured is started with setting of attributes by indicating templates for column names and/or contents. Data types in columns (i.e. numbers, strings or dates) are specified depending on what kind of information is to be located. The search can be conducted in a particular place – a certain database, schema or table. Depending on how you want to secure sensitive information in MariaDB (e.g. control access to it, monitor all operations, conceal data or make it unintelligible), the appropriate rule is selected – Audit, Security or Masking Rule. Avoid situations where your sensitive information within MariaDB might be at risk: monitor what requires to be kept private and make access to it available only on a need-to-know basis.